March 2017: In arguably the most unexpected moment of Tom's life, he's invited to join T-Bird on stage at the Ivory Coast Bar, Kanazawa, Japan. 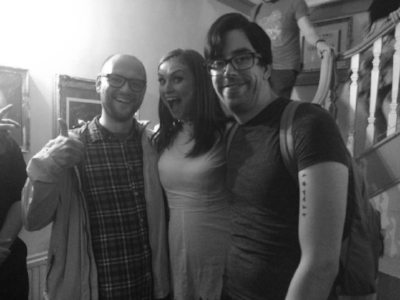 September 2016: Sophie Ellis Bextor proves to be a good sport, post show at Bush Hall, despite Rick stealing her phone. March 2017: Laura and Tom pose with the lead singer of sensational Japanese covers band Palm Springs at Grease Bar, Kyoto, Japan. September 2016: Awaiting Sunflower Beam at SCALA, Abi, Rhys and Tom assess how they've aged in four years since their last meeting. November 2016: Tom enjoys wine and horror at the Albert Hall, during an orchestral performance of Aliens. February 2017: Tom with the Old Devils Brendan and Rick catching up and arguing incessantly ahead of Conor Oberst in Manchester.